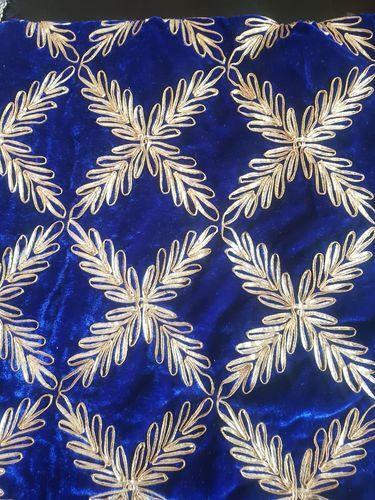 We are completely involved in providing a quality range of Velvet Embroidery Fabric to the clients. Optimum grade yarn is used by our skilled professionals in the weaving of this fabric. Our offered fabric is highly acknowledged for its, excellent finish and smooth texture and is used for designing different stylish dresses in textile industry. Moreover, we provide this fabric at to our clients at a reasonable price. Founded in the year 2003, Aarna Impex Private Limited is an excellent Manufacturer, Exporter, Supplier, Wholesaler, Trader and Importer of superior quality Glaze Bed Sheets, Single Bed Sheets, Reactive Bed Sheets, King Size Bed Sheets, 3D Bed Sheets, Infant Wears, Super Soft Blankets, Designer Blankets and Bed Sheets with Comforter. Our decades of experiences, has helped us to reach world-class designers and manufacturers of the market and collect attractive and comfortable products for our clients. All our collections are unique in quality, design, fabrics, prints and patterns. We are located in Delhi and maintain superior contacts in the textile industry to cater huge clientele in various different regions. Our broad exposure, wide distribution channel and reasonable cost have helped us to maintain a consistent position in the market. We are authorized dealer of Kidsway and aarna brands.